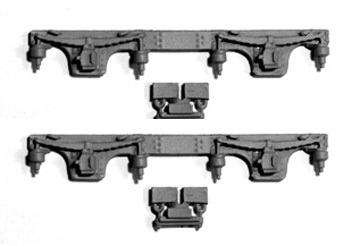 For use with MJT 2224 CCU or MJT 2553 Rigid Bogie Frame. Includes all sideframe castings and bolster detail. This bogie was used on earlier, Gresley era, full brakes. MJT cosmetic bogie side are supplied without brake shoes which are available separately - MJT items 2461 and 2462. Etched Step Boards are also available for this bogie: MJT 7031.